Stringtacular, an annual, free, public concert showcasing the achievement and vibrant collaboration of more than 300 1st through 12th grade string musicians from Merit School of Music’s Pilsen-based programs at El Valor Guadalupe Reyes Center and Whittier Elementary School as well as Merit’s Suzuki-Alegre Strings program was held on Saturday at Benito Juarez Community. 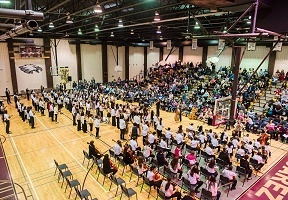 Stringtacular celebrates two remarkable decades of transformative music education for students who are renowned for their ability to fuse Latin Folk Music with the Suzuki method and repertoire. With a focus on culturally relevant programming that allows students to embrace and share their Latino heritage with the Chicago community, the Alegre Strings program also fosters self-confidence and a positive learning environment for young students. 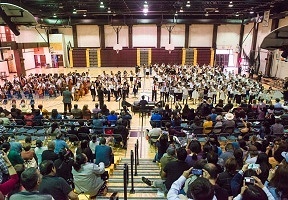 Since its founding in Pilsen in 1998, Suzuki-Alegre Strings students have performed several times at the National Museum of Mexican Art, including at its opening in 2001. They also have played for former Mexican President Vicente Fox, performed in Japan in 2013 at the Suzuki Method World Convention and have made several television appearances.